Phoenix dactylifera variety Medjool is widely used as an ornamental. Taller, thinner, and with spikier, bluish leaves than its popular cousin from the Canary Islands, the Medjool Date Palm is a handsome tree. The Medjool Date Palm's adaptability to a wide range of climates, excellent resistance to drought, salt spray, brackish water, and various pests, and its general robustness make it the palm of choice for dry climates, temperate as well as tropical. 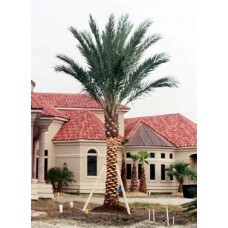 Phoenix dactylifera tolerates salt water intrusion and cold better than all the other Date Palms.